“U.S. Sen. Jim Inhofe said Tuesday that he still believes that former Tennessee senator Fred Thompson will get into the 2008 presidential race and is the Republican with the best chance of beating Democratic Sen. Hillary Clinton. “I’ve looked at it very carefully, and it’s my belief . . . (that) the only one I know can beat Hillary Clinton is Fred Thompson,” Inhofe told about 150 people at a Broken Arrow Chamber of Commerce breakfast at Cedar Ridge Country Club. 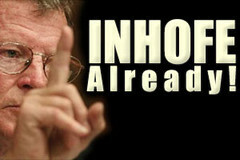 Inhofe predicted in June that Thompson would announce his candidacy around July 4. Now the speculation is that Thompson, who is probably better known to the general public for his acting than his term in the U.S. Senate, will enter the race early next month. I’m sure Senator Inhofe is aware of the embarrassing information about Fred Thompson that’s on the Internet and even the traditional media. How about this. Since former Senator Fred D. Thompson of Tennessee has not yet declared his presidential candidacy, he cannot advertise on television, on radio or in newspapers to promote his political ambitions. But on the Internet, his supporters can turn to his official Web site, www.imwithfred.com, where they are solicited for donations and asked to spread the word to friends, hold fund-raising parties and call talk-radio programs on his behalf. Visitors to the site can watch his “FredCast” and read “the Fred File” to get his views on issues like the economy and immigration law. Mr. Thompson, a Republican, has been able to set up what looks like a stealth campaign on the Internet because federal election laws and enforcement have failed to catch up with the surge in campaigning in cyberspace. As a result, he has been able to promote his positions and raise money through his Web site, all while technically remaining a noncandidate. And that status enables him to remain on television on “Law and Order” reruns without NBC facing demands from other candidates for equal time. It exempts him from the more rigorous rules on reporting donors that declared candidates must adhere to. With an FEC Complaint filed against Fred Thompson for, among other things, raising money for amassing campaign funds to be spent after he becomes a candidate, you would think he’d try to do a better job hiding it.